PLS Blog: Locker decorating tips! If you've read the book, you know that we take our lockers VERY seriously. I see it almost as my first apartment - a blank page and all mine to design and decorate. In the post below, Josie gave a locker decorating tip that I never even thought of - a piece of carpet for the "floor." Great idea! - How will it help me be organized? - How will I make it reflect my personality and look super cute? Starting with the organization, I love these magnetic wire baskety things that you can hang on the door. See the photo there! Be sure to check the measurements of your locker first to make sure your hanging baskets, other bins, and your piece of carpet will fit just right. What are your locker decoration tips? Any great ideas for themes? I'm thinking a beachy theme because I love the ocean. Too bad my locker's too small for a surf board! Get cool magnets and pictures and put them on the door! Also, if you know you're going to have a rough day the next day, write little encouraging notes in your books where you know you'll find them (with sticky notes). You should also keep a pack o sticky notes in your locker in case you need to remember something. Thanx for using my idea in your post, Jemma!!! Oh, and I think a garden or jungle theme would be super cool! But a candy shop theme would be even better! Lollipops everywhere...YUM! :( my locker gets jammed... i can do the combonation in like 3 secounds...and i have two lockers!!! how often do you update your poll? What I like to do is have a little magnetic drawing pad so if inspiration of any kind (what to study, a little happy saying, or even just a drawing) comes to you in between classes, you can write it down and you won't forget it. For the winter get a peice of cardboard and tape it 60cm above the bottom of your locker so you can put your boots on the bottom and your shoes on top, preventing wet shoes for inside. i actually need four lockers to hold all my things, that was seventh grade too! if you have more than one locker i suggest kepping the bottom one for books, and using the top one as storage and fun. i usually go to like target and buy things and use craft supplies and have a school decorating party. where my friends and i can make school supplies together, and tade if we dont like them. try buying somed colorful pencils and coating them with glue then glitter, instant glittery pencil. :) try things such as this because things like staples cost alot more money than what is practical of a pen or paper. Try using cute wrapping paper as fun and lively wall paper!!!! and don't forget the mirror. Another fun way to decorate your locker is to put your scrap booking skills into action!!! 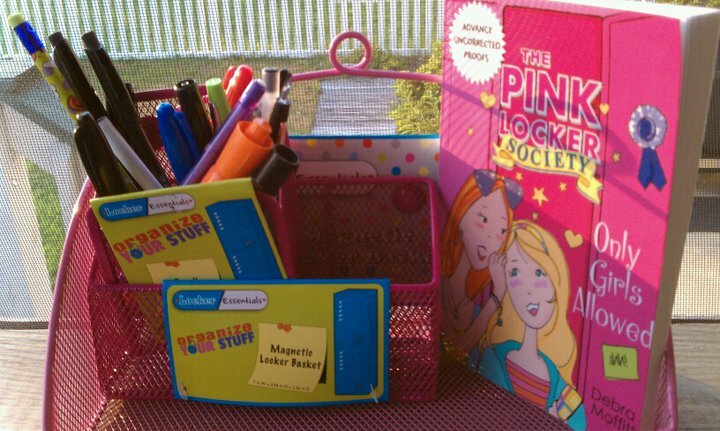 add glitz to folders, notebooks, and of course your locker!!! i don't know what to use to decorate my locker.whatever it is..must always be organized.any ideas?? Get some cool files to organize your stuff, you need a pretty school diary and lots of shelves and magnets, Paperchase is great for all these things, order them online because they have one shop in New York and lots in England but that is it. Anyway, also get a cool mirror to check your make up and hair and if you can get a magnetic one so you can stick pictures on with the magnets! Always stick up notes, pictures and stickers!! Hope this helped!! My brother (even though he's a boy) had a surfboard magnet for his locker in his 6th grade year, now i have it! So for your beach locker and surfboard, i just wanted to say you can get a magnet dry erase board shaped like a surf board! maybe not THE best advice but i hope it helped! I love the carpet idea! I asked my mom to buy me some magnets and one of those magnetic pencil holder things. for now I have to tape stuff up. You could also do a daily tip for yourself on a small wipe board. There are slits in our lockers that are perfect for notes. a girl in my grade had a wipe board on the outside of her locker. She puts comments up. well, i have to share a locker and the person i share it with is really messy! aby advice? My locker at school is tiny. where would I find some cool stuff for it. I have the locker for 5 years and have to fit my P.E bag in it. Do you know were i could find a decent magnetic backed mirror. i'm in 5th grade,so i dont have a locker.but i'll remembr these tips for next year!thanks! Im in fourth grade, and my locker is soooo empty! I really like the rug idea. Oh, and Clover, just go to Staples. They have lots of cool locker stuff! Hi guys i was wondering, what if your lockers are tiny? mine are... how can i decorate them even though thay are small and you cant do much? At my school we're not allowed to carry our backpack around. We have to keep them in our lockers & we don't have long lockers. So it's kind of hard to have a self & keep it organised. I have a top locker & no one has the locker under mine (my team (where we have classes) is small & not all the lockers are filled) is empty & if we have an empty locker under ours we can use it. I haven't decorated my locker yet, nor do I have a shelf, so I don't need another locker. I'm probably going to put up a pretty wrapping paper that has a white bakground & pink polka dots. Then I'm putting up pictures of my friends. When I go places or do things with my friends I'm the one with the camera & I'm always the one taking pictures, so I have hundreds of pictures with my friends so I'm gonna put those up. The school store at my school has locker shelves so I might just buy one from there rather than measuring my locker and trying to find one. That's all I have for now, so bye! <3 i make my own tie-dye peace sign magnets with clay. They are so Awesome! And I put pics of me and my friends in their to make it a little sweeter. After you put down the piece of carpet add a locker shelf some totally awesome wraping paper for the "walls" a mirror and last a little basket with a dry erase board to write those encouraging notes before a rough day or hard quiz. Thats all for now. Bye! P.S. have fun decorating your locker! Bye! Help me my mom didn't get me the lockers decorations like I told her to so now wat how can I make home made items for my locker to make it look like I bought them plz help! I suggest a organizer bin that's magnetic a mirror a cute little chandelier for a more girly look and shelves and a white board with dry erase marker of course AND some motivational quotes. U can get that stuff at Target, OfficeMax, or OfficeDepot. But I'm not sure about the quotes.